Curtis Joseph is well-known for the two decades he spent playing for six NHL franchises, but little is known about how he made it to the ice. Now, NHL fans can get the inside story behind the man known to his fanbase as "Cujo". A heartfelt foreword by former professional hockey player and Phoenix Coyotes head coach Wayne Gretzky. Background on where Joseph grew up, what it was like living in a halfway house for the mentally ill and how he made it to the NHL. Chapters on his relationship with his adopted parents and his journey to reunite with his biological mother. Tales from his remarkable journey through the NHL, from the St. Louis Blues to the Toronto Maple Leafs and everywhere in-between. 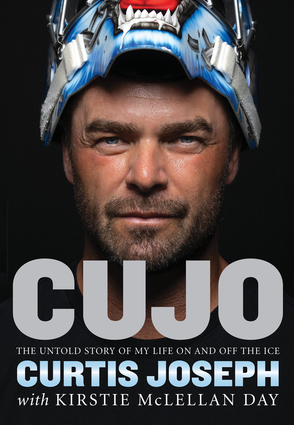 Combining heart and humor with insider stories, Cujo: The Untold Story of My Life On and Off the Ice is perfect for hockey aficionados eager to learn how an unlikely NHL star was born. Curtis Joseph played 18 NHL seasons as a goaltender for the St. Louis Blues, Edmonton Oilers, Toronto Maple Leafs, Detroit Red Wings, Phoenix Coyotes and Calgary Flames. A three-time All-Star, he also won a gold medal with Team Canada in the 2002 Olympics. Joseph currently serves as a goaltending consultant in the Carolina Hurricanes organization. Kirstie McLellan Day has co-authored books with Wayne Gretzky, Theo Fleury, Bob Probert, Ron MacLean and Kelly Hrudey. She lives in Calgary, Alberta.